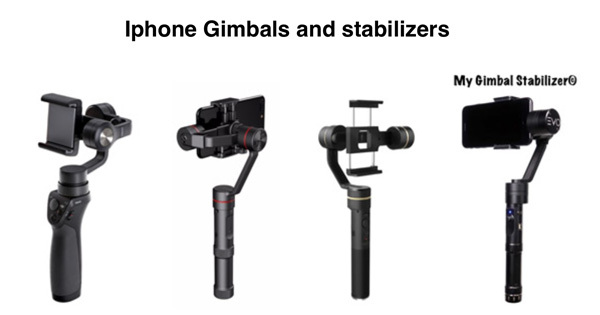 Home / smartphone gimbals / iPhone stabilizer and gimbal : which one should you choose ? As you may know, there are currently ever more iPhone stabilizer and gimbal that you can find with quite a few different manufacturers. As you’ll see in this article, most of the iPhone stabilizer and gimbal manufacturers are Chinese and provide some very good products. The difference between shooting videos with and without a stabilizer is really significant, which totally explains why so many people now buy iPhone stabilizers and gimbals to shoot very smooth and stabilized videos. Let’s have a swift overview on the different products you may find. How do iPhone stabilizers work ? You may have heard about smartphone and iPhone stabilizers and gimbals. 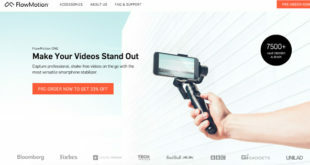 Indeed, these very new and high-tech products are meant to stabilize your videos shoot with your iPhone and other kind of smartphone. This is enable thanks to 3 brushless motors which perfectly compensate all the moves you do. Therefore, contrary to a selfie stick for instance, you’ll need battery to make them work. This is something on which we always focus when we do our in-depth reviews. Indeed, the battery can differ a lot from one product to the other. For instance, the Zhiyun Smooth 3 offers up to 14 hours of battery life which is just insane. Of course, it is one of the iPhone stabilizers we’ll present to you in this article. Basically, an iPhone stabilizer is a grip on which you’ll mount your smartphone in order for it to use the 3 brushless motors to be stabilized. 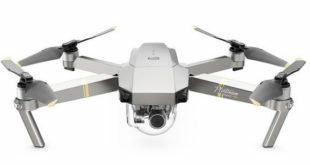 You’ve got quite a few different manufacturers on the market, but, without any doubt, the 3 biggest are DJI, Zhiyun et Feiyu, three Chinese manufacturers. Their products are really good quality and you’ll definitely manage to shoot pro-quality videos with your iPhone. Be it an iPhone 5 or 7 Plus, you’ll manage to balance it with the very clever balancing system of the gimbals. Now, let’s have some very short overviews of the main smartphone gimbal and stabilizers for iPhone that you may be interested in. The first very very good iPhone stabilizer and gimbal that we want to talk about is the DJI Osmo Mobile. Indeed, the latter is really excellent on many different criteria. As a matter of fact, it certainly offers the best quality and reliability we’ve never tested. You definitely will manage to shoot smooth and stabilized videos with this iPhone stabilizer. What we also very like about it is the fact that the mobile application to control everything is working almost perfectly. As you’ll see later, this is not necessarily the case of all smartphone and iPhone gimbals. With the DJI Osmo Mobile, you’ll have a very good experience and shooting videos with vibration will definitely be a thing of the past. The only think we can criticize about it is that its battery life is quite limited. According to your activity, it will be between 4 and 5 hours approximately. For most situation, this is enough, but if you want to shoot videos for a whole day, you might get a bit frustrated. The second iPhone stabilizer and gimbal that really pleased us during our review is the Zhiyun Smooth 3. This is the latest product from the biggest gimbal manufacturer in the world, Zhiyun. It does quite a few different gimbals for Gopro, smartphone and DSLRs. What we most like about this iPhone gimbal is its insane 14 hours battery life. Furthermore, you’ll be able to recharge your phone while in use which is quite interesting. Of course, it also offers a very good stabilization. For now, the Zhiyun Smooth 3 has the best we’ve tried. Indeed, we were really impressed during our test by the quality (almost flawless) of the stabilization we could have on our videos. As far as functions are concerned, this gimbal is really impressive. Indeed, it has some very innovative functions such as the exposure, ISO, white balance,… modification directly from your grip. This is something we really enjoyed and you’ll definitely like it when using your iPhone stabilizer. The only considerable drawback with the Zhiyun Smooth 3 is its mobile application…for Android. Therefore, if you are using an iPhone, you won’t be disappointed at all with this gimbal which will enable you to get rid of every vibration. The Feiyu SPG is also one of our favorite iPhone stabilizer. Indeed, the first thing we really like with it is the fact that you can balance your phone very easily and swiftly. Indeed, thanks to the clever system, you’ll be able to change from one Gopro to an iPhone within a few seconds only. Because yes, one of the strength of this stabilizer is that you can mount both a Gopro and a smartphone which is quite cool for people who hesitate between these 2 cameras. The quality of the stabilization is also very good even though it is slightly less perfect than the Zhiyun Smooth 3 and its insane stabilization. Unfortunately, even though the battery life can last up to 8 hours, you won’t be able to recharge your phone, which is quite sad to be honest. As far as functions are concerned, one more time, it is a bit disappointing as you won’t have as many as the DJO Osmo Mobile’s or the Zhiyun Smooth 3. Finally, the mobile application is really no match for the DJI Osmo Mobile’s. Still, this is definitely one of the best iPhone stabilizer you can find for the time being. If your are looking for a cheap iPhone stabilizer and gimbal, you might definitely be more than happy with the Zhiyun Smooth Q. 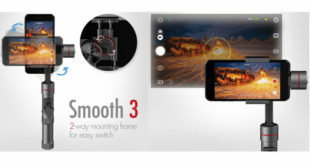 Indeed, this stabilizer is the low cost version of the Zhiyun Smooth 3. It will cost less than 150$ and really managed to please us during our test. As a matter of fact, it offers quite a few very interesting functions as you can see in our Zhiyun Smooth Q review. The tracking mode or the pan mode are quite impressive for so cheap a gimbal. As far as this is concerned, we can also name its principal competitor, the Feiyu Vimble c which is also very good at these functions with the exact same price. Finally, we can also talk about the very good battery life of this iPhone stabilizer. Indeed, the Zhiyun Smooth Q offers up to 12 hours of running time. On top of that, you’ll be able to recharge your smartphone while in use which is very important according to us. You’ll of course have plenty of other stabilizers and gimbals for iPhone. As we’ve just said, there is the Feiyu Vimble c which is definitely worthy of interest but also the Feiyu SPG Live, Feiyu SPG Plus, the EVO SP-PRO,… All offer very good outcomes for your videos shot with your iPhone. If ever you want to shoot action videos, we definitely think that you’d better use a Gopro gimbal. In order to help you find the best ones, you can read our article in which you can find the best Gopro Gimbal or read our different in-depth reviews. For “normal” activity, an iPhone gimbal is enough. You might have to use Gopro gimbals and stabilizers if you go for extreme-sport like mountain bike, skiing, … and basically all activities that move a lot, though. Among the best gimbals for Gopro, we particularly like the Removu S1 or the Gopro Karma Grip. The latter is really excellent for extreme-sport activities. This is not for no reason if so many professional sportsmen use it for their main activities. You can read our Gopro Karma Grip review if you want to know a bit more about this excellent gimbal. Now, you basically know everything you should about iPhone stabilizer and gimbal. 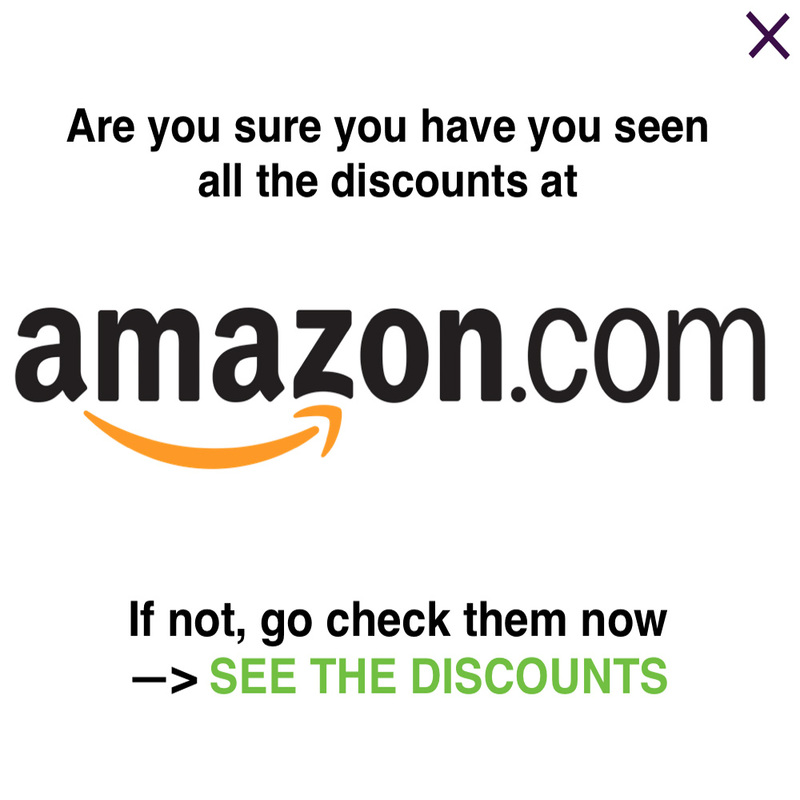 We hope that this article was helpful and we truly thank you for your visit. 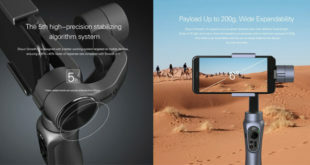 Previous DJI Osmo Mobile : why do we like it ? Why don’t we ? Next What gimbal stabilizer should you use for Summer vacation ?